No closed season blues this year, I'm planning to fish at least every couple of weeks while I'm waiting for the river season to re-open. And the first trip was to Marsh Farm this weekend, in search of a tench with James and Richard. 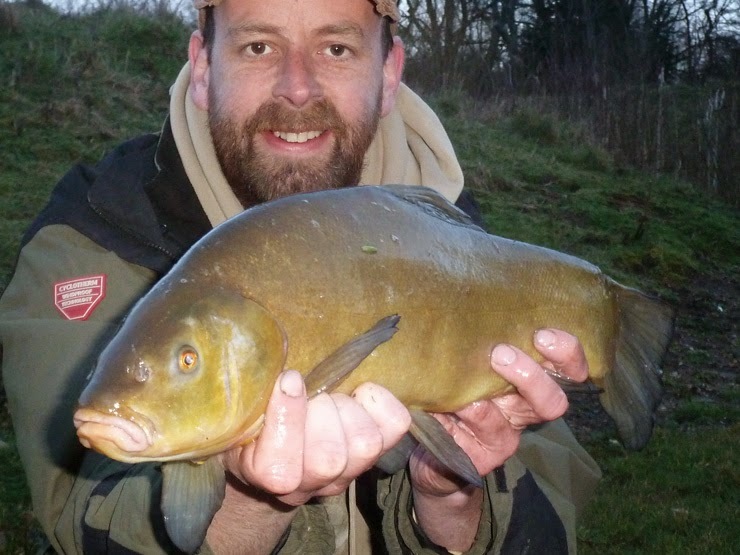 My tactics were simple; a bait and wait approach, lift method and as light gear as I dared. 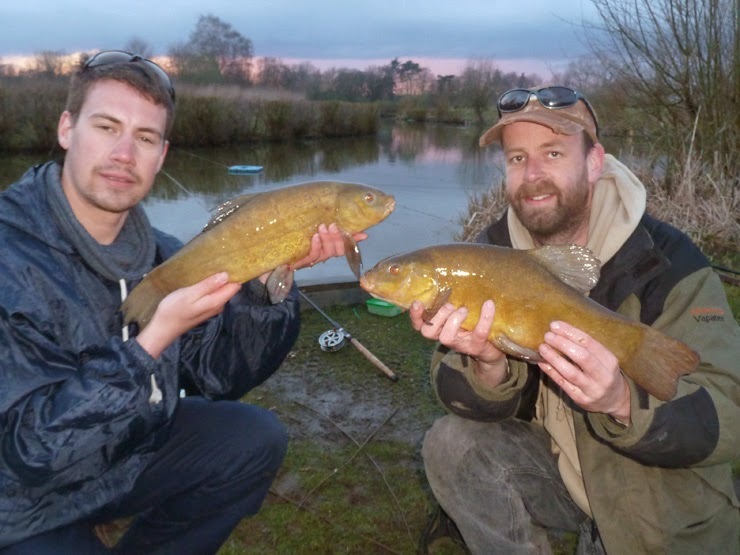 Richard had a tench fairly quickly, while James wandered off exploring, the problem with fishing with these guys is they are rather good at catching fish, and as I was fishing differently I did start to doubt my tactics. I stuck with it through very windy conditions and just after lunch I had my first bite. 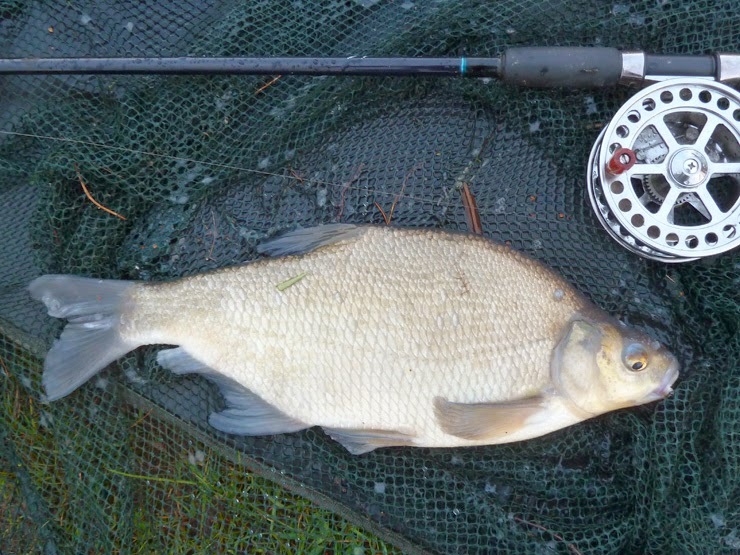 Then I started getting a few roach and skimmers while I waited for a larger fish to arrive. 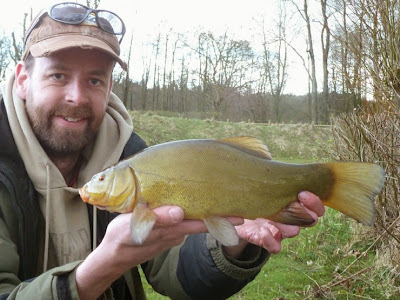 I've never really fished for tench before and my PB was a tiny 12oz. 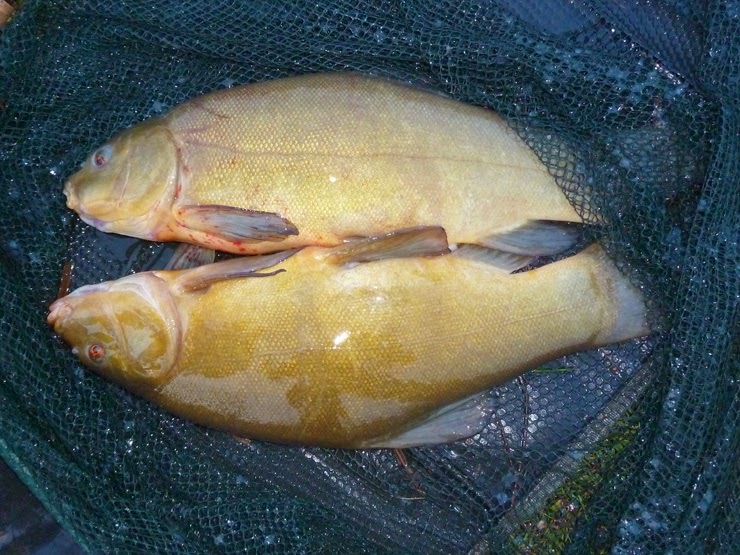 A bumped off fish signalled the tench had arrived, next cast produced my prize, a 1lb 4oz tench (top photo) - the first of five times I was going to up my PB this afternoon. James joined me and now it was a bite a cast. 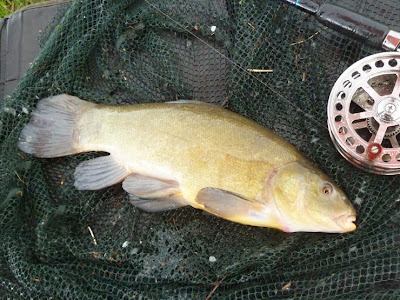 I had another tench followed by three bream. Weighing and photographing everything slowed us down a bit but tench were new to me and I needed PBs! 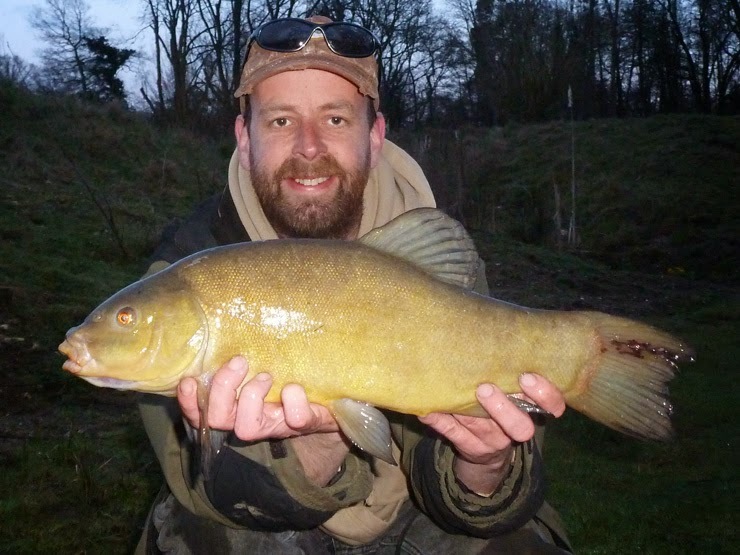 With the action thick and fast me and James managed a double hook-up, two fish in the landing net at the same time. They really didn't want to both pose at the same time for the camera, but Richard managed a photo under a stormy sky. I had now upped my PB to a rather more respectable 4lb 7oz and running out of time one last cast upped it again to 4lb 14oz. With a swim full of fish it was difficult to drag ourselves away. My final score was 9 tench, 3 bream and a dozen or so roach and skimmers. 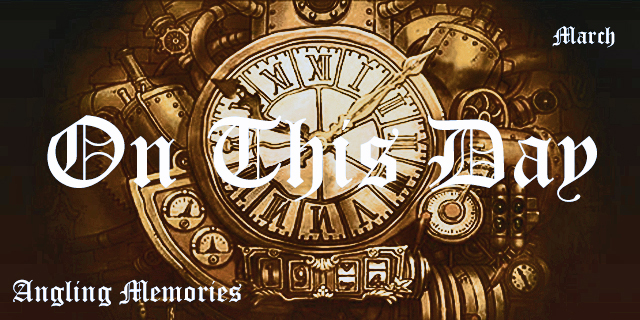 And an important new PB, next step is a five. James managed 6 tench and a little roach and Richard managed 3 tench, about 9 or 10 nice bream and a dozen or so roach, skimmers and hybrids. A great day all round. 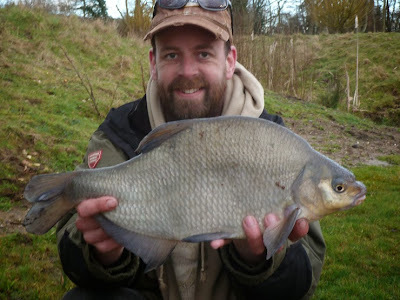 Im glad we all caught, the weather was not conducive at all to fine fishing tactics, lets hope next time the weather behaves itself and we tear it a new %&#£........ Ive designed a new rig which i feel will slaughter the Crucian stocks once it warms up, so i cant wait to put it into practice. Glad you caught a few PB's, its always nice achieve such feats but it will get harder as you approach the higher echelons, but Marsh Farm can produce that double believe me. Already looking forward to next time, was great we all caught and it was fantastic to get a few tench on my scorecard. Looking for a five plus next time. 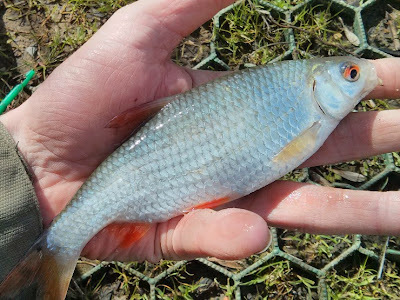 Look forward to seeing your crucian rig, looking forward to testing my resistance-free zander rig later in the year as well. 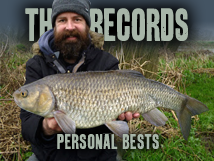 It's great getting a slightly more respectable PB on the list, you can only have a PB run like that if you've never caught or only ever caught a baby before... Never caught a crucian so fingers crossed! Great looking fish fellas. Well done. Nope, still won't let me leave a comment in the anonymous setting.